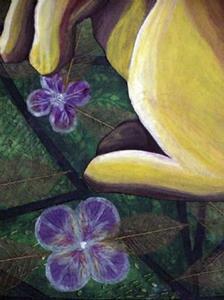 This piece is a 16 by 20 inch collage painting on stretched canvas. 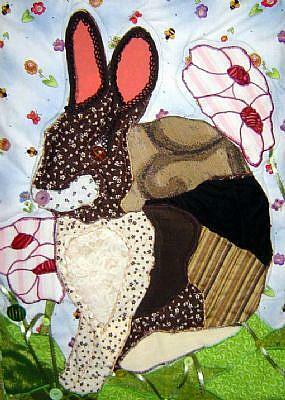 I ripped this from Cynthia Gaub’s fabric collage “TELL ABOUT THE RABBITS, GEORGE”. I chose this piece because I was especially attracted by the reference to Steinbeck’s OF MICE AND MEN, and I also love the fact that Cynthia created her piece with fabric. My entire canvas was first primed in black. The background of my version uses geometric cuts from patterned scrapbooking papers. Various sized rectangles glazed in blue with darkened edges compose the sky. The triangular ground pieces are similarly done in green glaze. 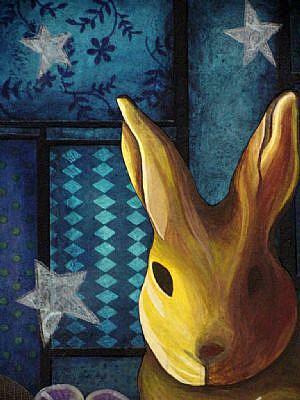 The rabbit is acrylic paint on watercolor paper cut to shape. The flowers are from an artificial floral supply as are the transparent leaf shapes. The stars are hand cut from mulberry paper. 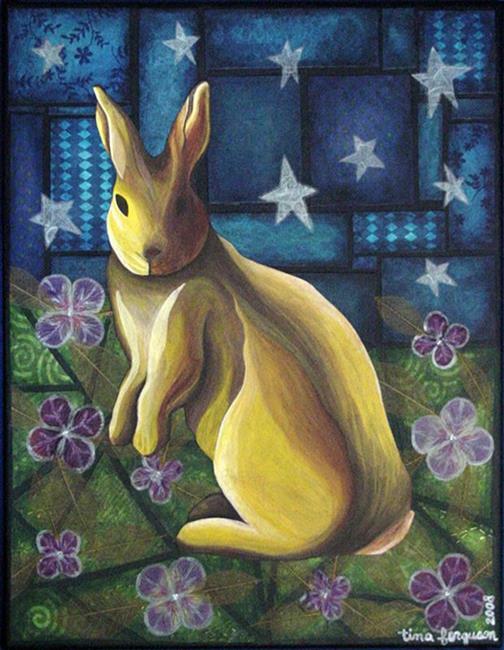 Prismacolor pencils were used to highlight the stars, flowers and leaves. Also the flowers are highlighted with permanent metallic marker and a fabric paint center. All was adhered using Liquitex matt gel medium.